Mental Health Disorders Sourcebook, 7th Ed. Mental health encompasses thoughts, actions, and feelings. Mentally healthy individuals are able to cope with life’s challenges, handle stressful situations, deal with anger, maintain meaningful relationships with others, and enjoy life. Despite the benefits, maintaining a healthy mind is not always possible, and mental disorders are common. Mental illnesses are common in the United States. Nearly one in five U.S. adults suffers from mental illness, which is estimated to be 44.7 million in 2016. Mental illnesses include many different conditions that vary in degree of severity, ranging from mild to moderate to severe and estimates suggest that only half of people with mental illnesses receive treatment. 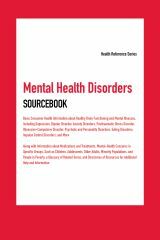 Mental Health Disorders Sourcebook, Seventh Edition discusses how the brain works, the components of mental wellness, and the processes that lead to illness. It offers information about the major types of mental illness and their treatments, including affective disorders, anxiety disorders, psychotic disorders, personality disorders, and disorders that impact behavior, including impulse control disorders, addictions, and eating disorders. A special section looks at pediatric issues in mental health and another examines the distinctive concerns of other specific populations. Information is also included about the relationship between mental health and chronic illnesses, such as cancer, epilepsy, heart disease, pain, and sleep disorders. The book concludes with a glossary of mental-health terms, a list of crisis hotlines, and a directory of mental-health organizations. Part One: The Brain and Mental Health explains the components of healthy brain functioning and the processes that can go awry leading to mental illness. It also discusses lifestyle and other factors that can help reinforce mental wellness. Part Two: Mental Illnesses begins with information about the link between suicide and mental illness and facts about suicide prevention. It goes on to describe the various classifications of mental health disorders, including depressive and other affective disorders, anxiety disorders, psychotic disorders, personality disorders, and other disorders that impact behavior. Part Three: Mental Health Treatments addresses the different ways mental health disorders are diagnosed and treated. It offers guidelines for identifying mental health emergencies, explains the services available from different types of mental health professionals, and discusses medications used to help control symptoms of mental illness. The part concludes with a chapter about complementary and alternative medicine for mental health care, which includes facts about dietary, physical, and spiritual therapies. Part Four: Pediatric Mental Health Concerns describes the special issues that arise when children and teens have psychiatric needs. It offers specific details about some of the most commonly occurring mental health issues among young people, including attention deficit hyperactivity disorder, autism spectrum disorder, bipolar disorder, depression, and learning disabilities. Part Five: Other Populations with Distinctive Mental Health Concerns addresses concerns among men, women, older adults, and other groups for whom special considerations may impact mental wellness. These include people dealing with the psychological impact of prejudice and discrimination, trauma or disaster, cultural isolation, and poverty. Part Six: Mental Illness Co-Occurring with Other Disorders explains the ways physical conditions can sometimes affect psychological well-being. It discusses some specific disorders commonly associated with changes in mental health status, including cancer, diabetes, epilepsy, heart disease, and stroke. It also addresses issues related to sleep disorders and mental functioning, and it examines the complex relationship between mental health and the experience of pain. Part Seven: Additional Help and Information provides a glossary of mental health terms, a list of toll-free helplines and hotlines for people in crisis, and a directory of mental health organizations.